This chicken breast recipe is really easy and quite delicious. 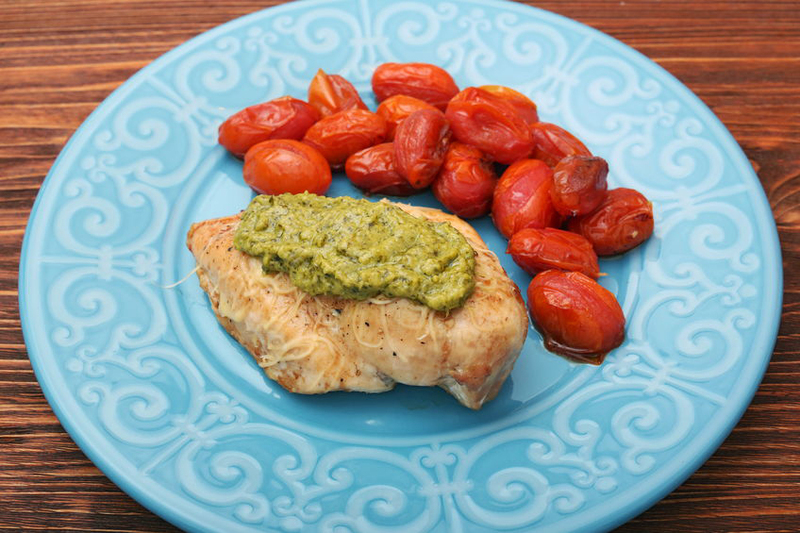 Marinated in a pesto-like sauce, grilled and then served with more of the sauce on top, it will become a favorite of yours for the ease of preparation and the wonderful flavor. Everyone likes macaroni and cheese, but sometimes it’s nice to change it up a bit. 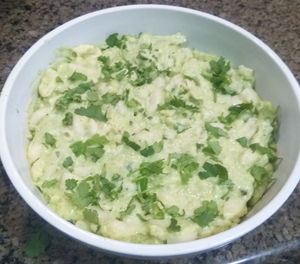 In this recipe avocados, lime, and cilantro add an interesting twist to the old favorite. Fantastic taste says Mary Lou. 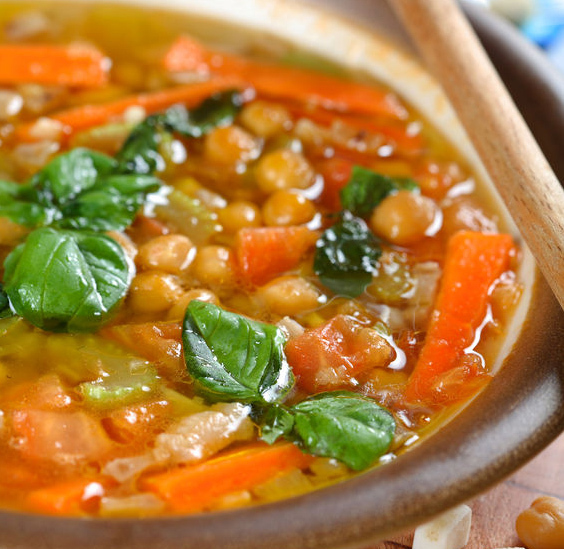 This is a lovely, hearty soup featuring red lentils, chickpeas, and assorted vegetables (get creative). It's not only tasty, but it's beautiful, too. 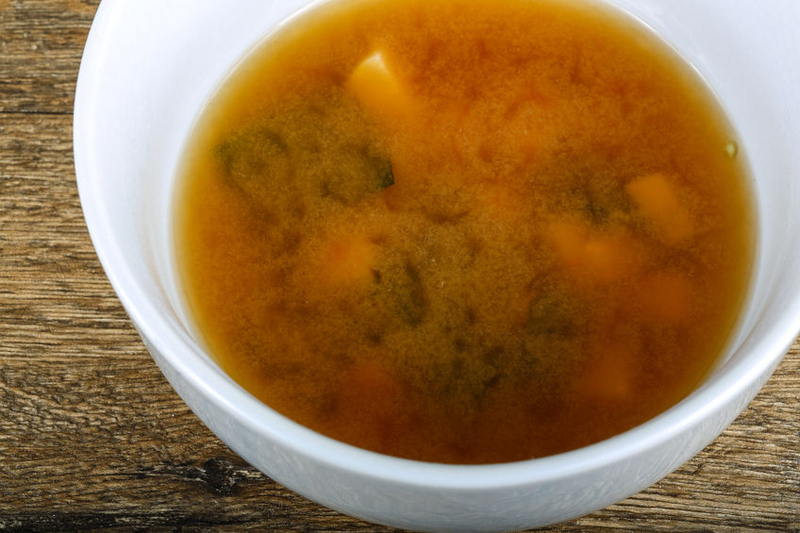 Try Mary Lou’s version of Alchemy’s miso soup. It’s a winner! Kick up the spicy factor with either Chipotle or Baklouti Green Chili Olive Oil. This is one of Barbara’s favorite recipes. She first ate this at a restaurant in Palo Alto and has savored it ever since. Try it. You’ll love it, too. Delicious and easy to prepare. Once you’ve done it, you’ll want to make this over and over again. It’s that good! Snow is coming to the foothills. This is a perfect stormy night recipe. This is a hearty, very satisfying soup. Together with some crusty french or garlic bread bread and a green salad, you have a complete meal that everyone will enjoy. 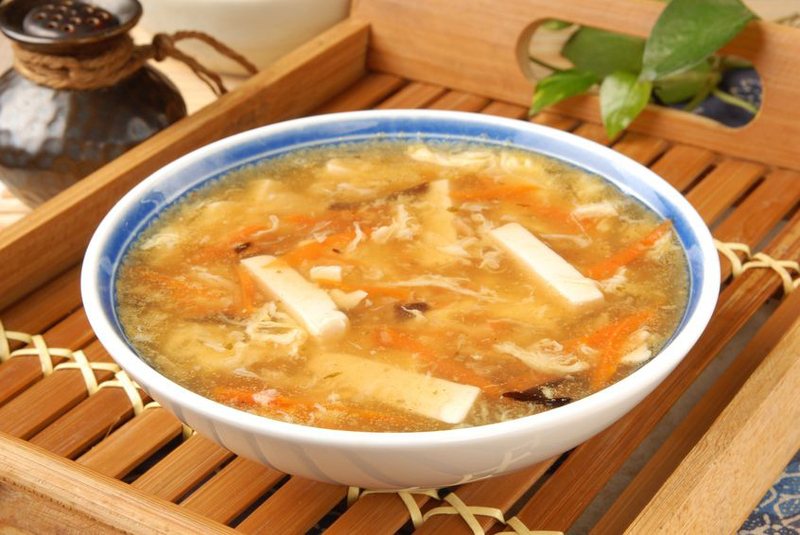 Champon is a popular Korean-Chinese noodle soup. It’s loaded with vegetables, seafood and pork. Full of robust flavors, this is a hearty, spicy soup. 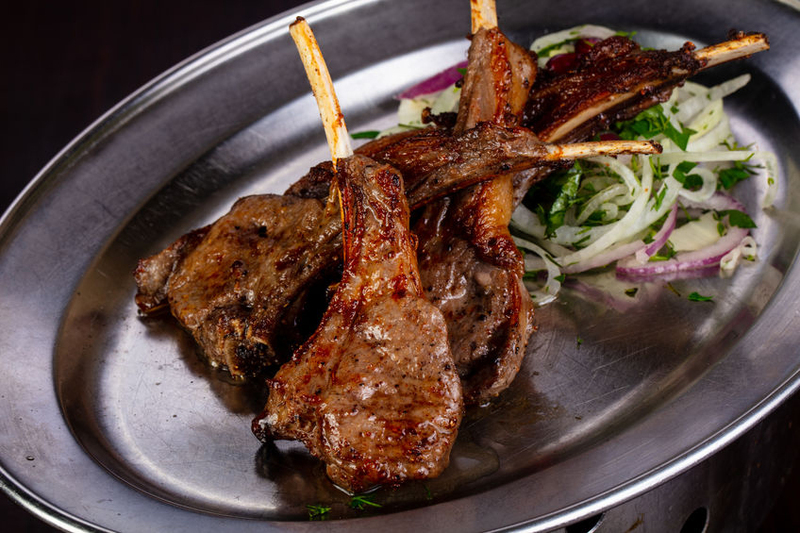 A Mediterranean blend of herbs called za’atar makes these lamb chops really special. If you can’t find this spice at your grocer’s, we’ve included a recipe for you. 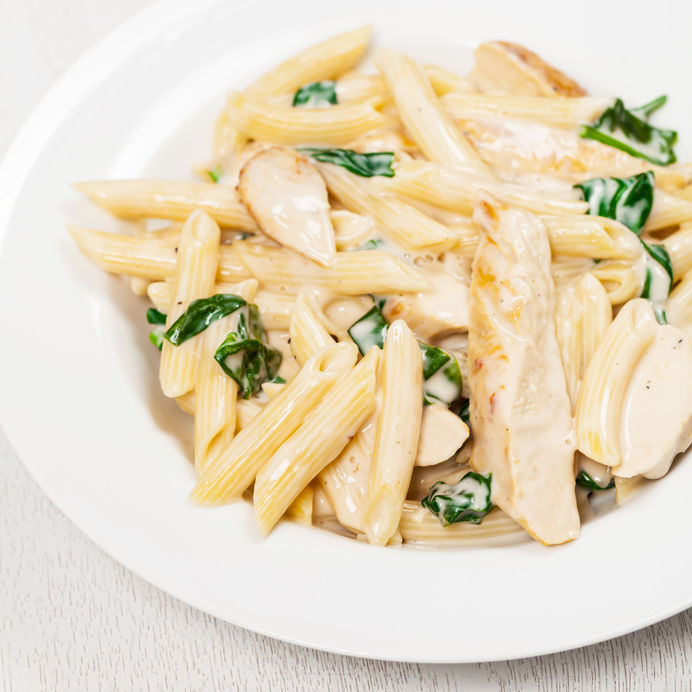 This penne pasta dish is a real comfort food dish. Filling and yet light, it really hits the spot at the end of a hard work day. 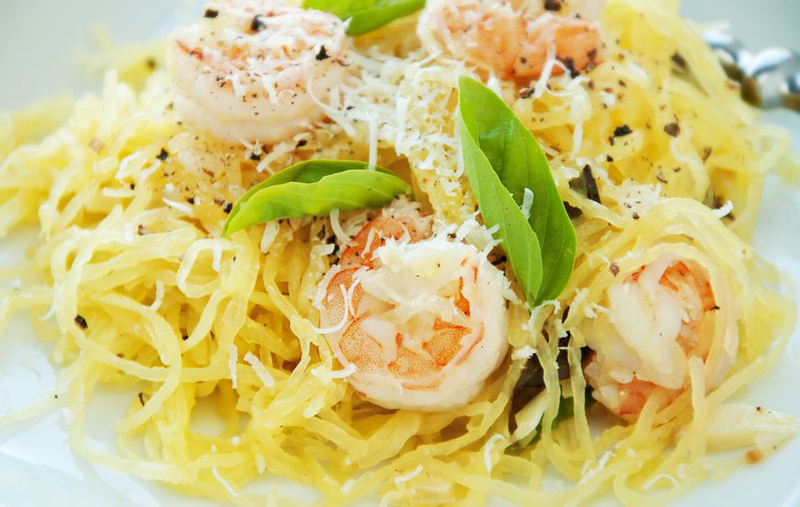 Our spaghetti squash shrimp scampi is a special treat. 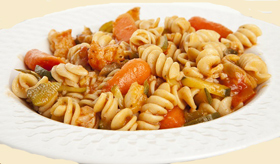 It looks like shrimp served over pasta, but it’s a much lighter version. 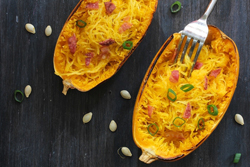 The spaghetti squash is fun to fix and you’ll delight in the calories you save by using it instead of pasta. 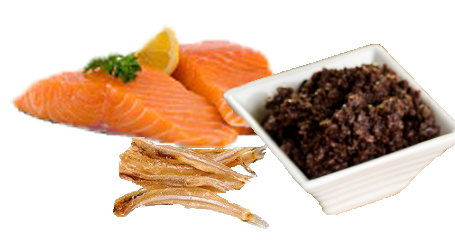 Omega-3 rich salmon topped with a Milanese Gremolata Olive Oil-anchovy- kalamata olive- tapenade. Absolutely scrumptious. 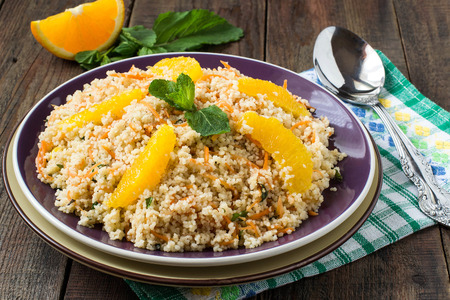 Bulgur is a wonderful grain, full of fiber, and quite delicious. This preparation is especially flavorful, full of aromatic spices, herbs, and oranges. 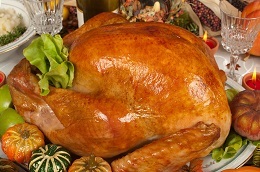 For a special turkey that is both brined and marinated, try this adaptation of Chef Jose Garces’ orange-lime marinade. 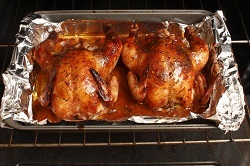 The brining and marinating make the bird especially delicious and moist. This recipe, which can easily be made ahead, is gluten free and healthy for everyone. 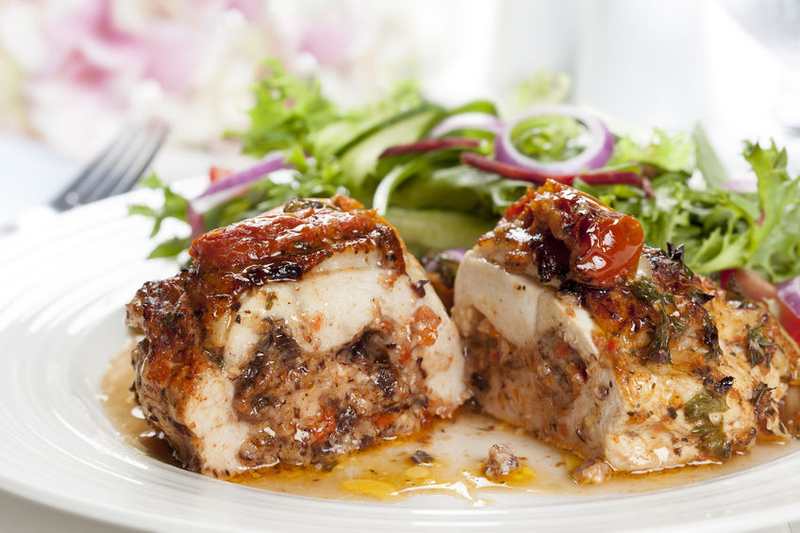 The Italian salad dressing keeps the chicken breasts moist and the potato-tomato stuffing is delicious. 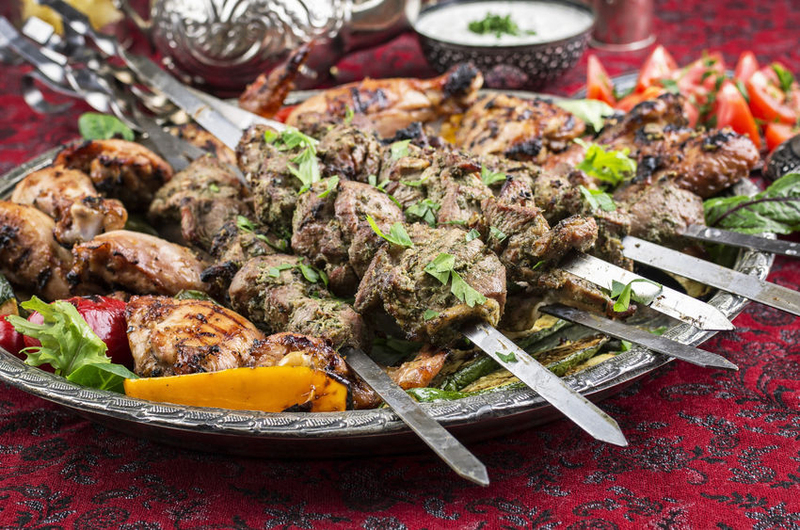 These juicy lamb kebabs are tender and tasty. The yogurt sauce that accompanies them makes them even more delicious. If you're a lamb lover, this dish will make your day. 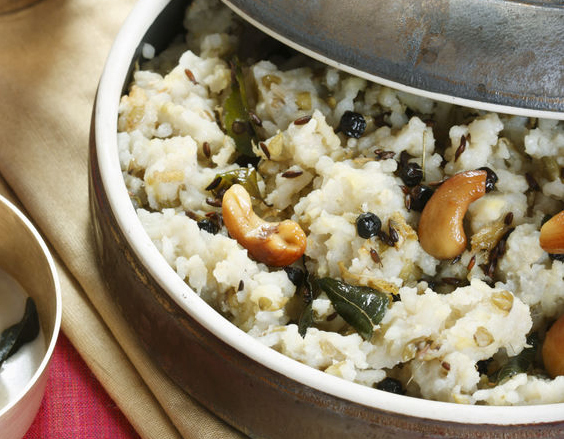 Ven pongal is often prepared in southern Indian homes and is considered a comfort food. This is a easy to prepare tasty dish to welcome the cooler days of fall. It smells divine while cooking and tastes even better. We're sure you'll love it, too. A simple, delicious thick soup made with vermicelli (fideos), much loved in Mexico. This soup can be served as a main course. 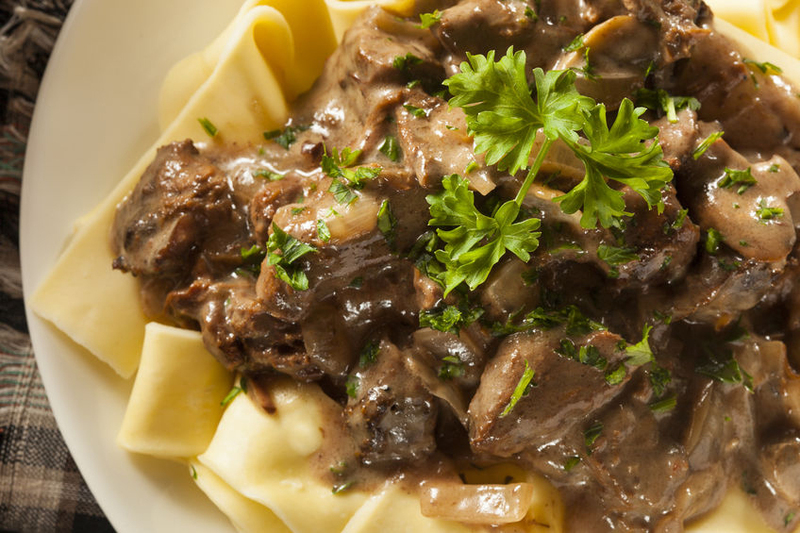 Beef Stroganoff is the ultimate comfort food for cooler weather. Beef, noodles, mushrooms, sour cream....what could be better! 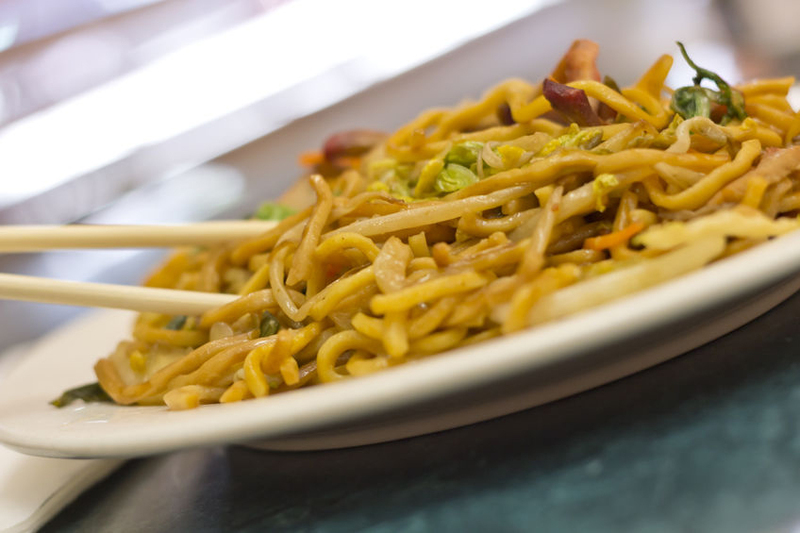 For a quick dinner on busy week nights, try this 5-Spice Pork Lo Mein. It's filling and delicious. 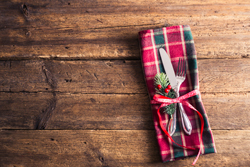 Everyone in the family will enjoy this meal. What a good way to get your kids to eat Swiss chard! This version of lasagna, based on a Martha Stewart recipe is delicious. The no-boil noodles make it easy! 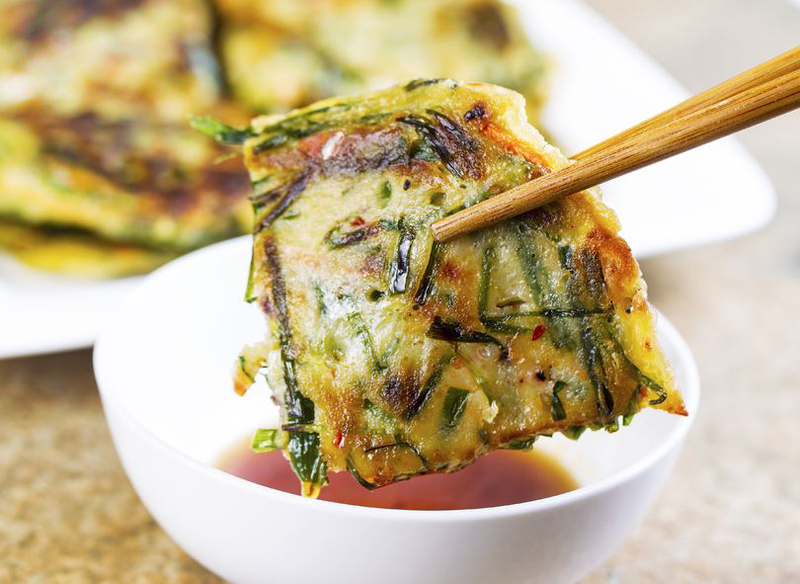 For you Korean food afficionados, this is a mouth-watering delight. 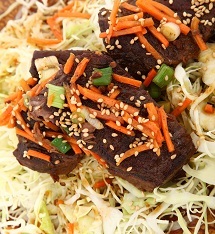 Kalbi, or Korean Barbequed Beef Short Ribs, are easy to prepare and very tasty! If you love peanut sauce, you will absolutely love this pasta/zucchini noodle dish. It has spicy flavors and the coolness of lime, cilantro and basil. 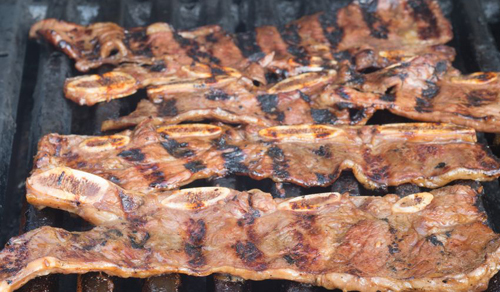 Beef Bulgogi is also named Korean BBQ Beef. 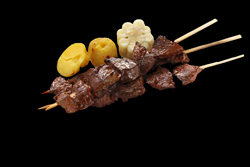 The marinade is delicious and imparts such a great taste to the beef. 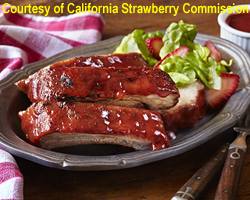 This will become your new favorite BBQ dish! Spice up your fish fillets with this tasty fish rub. 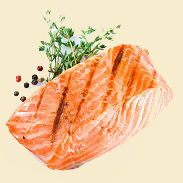 It is wonderful on salmon but can be used for any other fish fillets that you like. 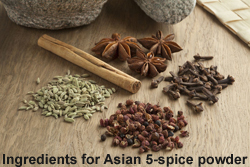 Asian Dry Rub for Pork Tenderloin, etc. What could be better than a lovely pork tenderloin dinner. Easy to prepare, this recipe will surprise you with wonderful tastes and ease of preparation. 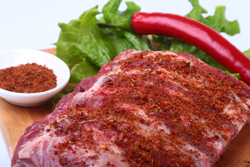 According to Mary Lou's sister, Barbara, this makes the best leg of lamb you've ever eaten. 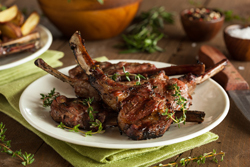 If you're a lamb lover, you must try this recipe! 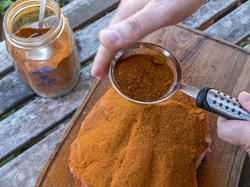 Instead of slathering your ribs with sauce, try the dry rub method. You'll be amazed at the mouthwatering results. Love Roasted Chicken? This rub makes the most deliciously seasoned chicken. And it's so easy to prepare. This will soon be a favorite of your family. This makes a great pulled-pork dish. The blend of Mexican spices goes so well with pork. 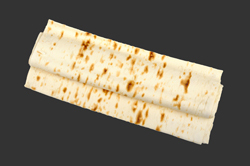 Served on bun or in a torilla, you can have an easy dinner in no time flat. 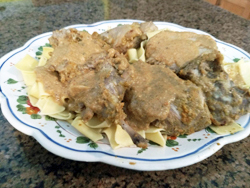 For a special treat this spring, try our rabbit (Hasenpfeffer) recipe. If you've never tried rabbit, give it a try. It's definitely worth the effort! 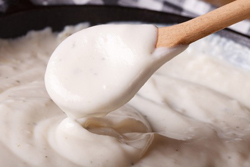 This makes a really smooth white sauce that can be used in many different recipes. The olive oil saves you from dealing with lumps in your sauce. Nothing beats the aroma of beef stew cooking in a crock pot all afternoon. 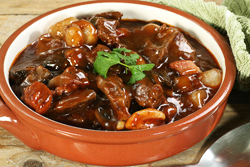 This beef bourguignon that will tempt you throughout the entire cooking process. Is your spouse a pork lover? This is a very easy and surprisingly tasty dish that would be an instant hit for Valentine's Day. We're sure you'll like it. 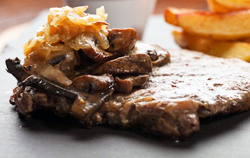 Steak is always a treat but the beer soaked mushroom/onions make this dish really stand out. The roasted potatoes with blue cheese top off this perfect meal. 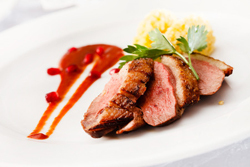 For a more exotic, romantic dinner for 2, try this tasty duck breast recipe. Very easy to prepare. 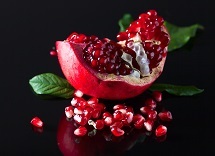 Served with pomegranate citrus sauce, this is special! If you like risotto, you will love this dish. 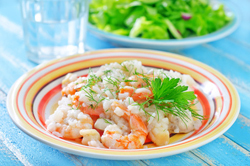 The creaminess of the risotto, mixed with Parmesan, and served with large shrimp makes for a special treat. Corn and black beans are a great duo. 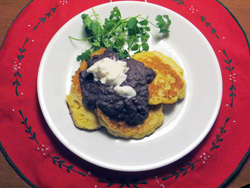 These corn fritters topped with a spicy black bean mixture and sour cream make a quick and scrumptious dinner. Quite easy to make, this dish packs a lot of flavor. The mint. 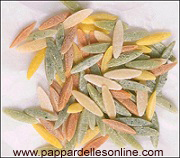 dried fruit, and honey deliver a tasty touch, balancing out the pungency of the arugula. This has always been a favorite of Barbara and Mike. They usually serve this with cornbread and a salad for a perfect fall/winter dinner. Easy and delicious. This recipe is extra delicious because of the relish. The onions are savory, the marmalade adds sweetness and the jalapeños add a bit of heat. Delicious! Sometimes the simplest of pasta presentations are the best. 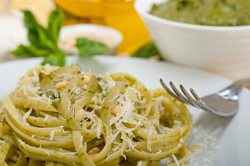 I love this recipe with just the pasta and beans served with a simple basil-lemon sauce. Yum! For you duck lovers, this is a great recipe. 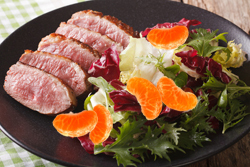 The orange, shallots and vinegar cut the richness of the duck and contribute a wonderful blend of flavors. 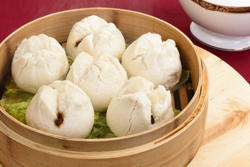 As kids, this was one of our favorite dishes. 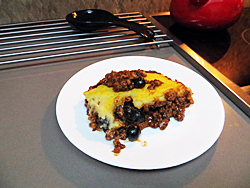 We loved "Tamale Pie" nights. Mom got the recipe from the back of a cornmeal box. It's a keeper. This Southern specialty is so good. 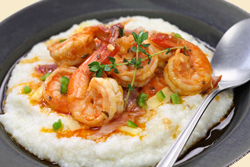 If you've never tried grits, this is the recipe to start with. You'll be hooked. 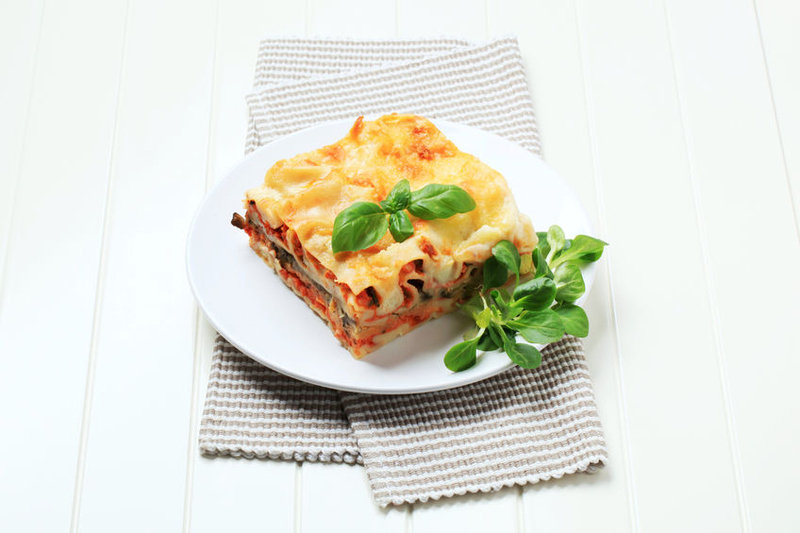 This is a wonderful meatless meal that is like lasagna in taste and preparation. 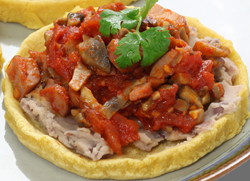 Using prepared polenta, it goes together really quickly. Delicious! 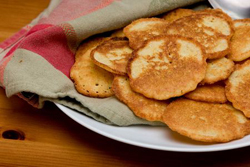 Looking a lot like pancakes, but tasting like cornbread, this crispy-edge unleavened Southern bread is a real treat. Can be eaten alone or served as dessert. All you oyster lovers.....this is your new go-to recipe. It's tasty and spicy and will make you a true oyster afficionado. Try it today. 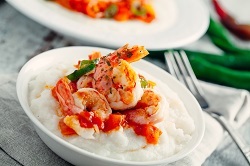 This spicy prawn dish served with cornmeal grits is to die for. Not difficult to make (the hardest part is assembling the spices), but worth the effort. Great recipe to get kids to eat their vegetables. Cooked, the spaghetti squash looks like spaghetti and the pine nuts and bacon on top make it sooo good! In a hurry to get dinner on the table after a long day at work or because you had your nose in a good book? Try our one-pan dinner for a quick, tasty meal. Spicy curry chicken thighs that everyone will be talking about. 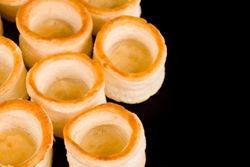 These are so delicious and pretty, everyone will want your recipe. 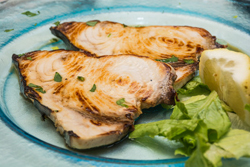 Swordfish is best when prepared in a simple way. This pan-seared swordfish, topped with a lemon-lime mixture, is both tasty and colorful and just a touch sweet. This sushi-grade tuna salad is enhanced by coconut and lime flavors. Delicious, easy-to-prepare salad. 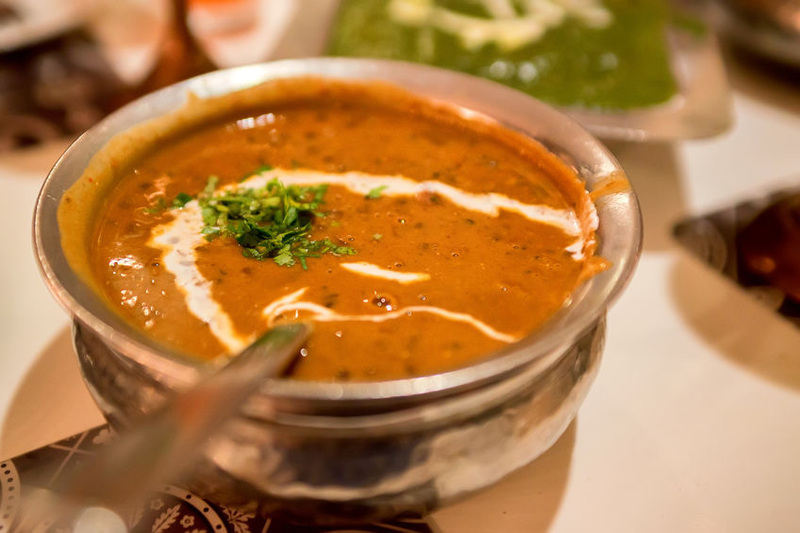 If you like Indian food, you'll love this dish. 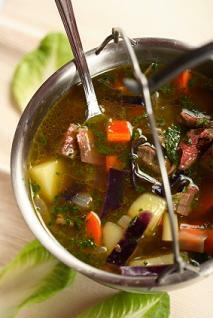 A healthy vegetable stew, it's colorful & very easy to make. Perfect for vegetarians & everyone! Ready for something funt? 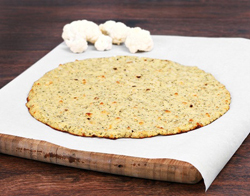 Try our cauliflower pizza dough and top it with a delicious spicy sauce and toppings. You'll be surprised how good this is! This recipe combines flavors of the two most popular veggies of the moment: cauliflower and kale. Easy to prepare and tasty! 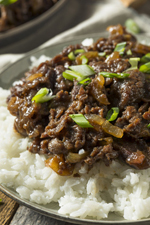 This coffee flavored beef dish is really delicious. 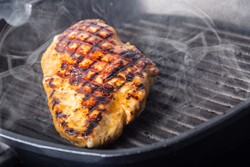 It's easy to make, easy to grill, and looks beautiful when sliced diagonally against the grain. This coffee-based rub is just delicious. Grilling the chicken will keep it nice and moist. 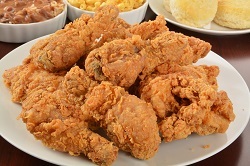 This will probably turn out to be your "go to" chicken recipe! 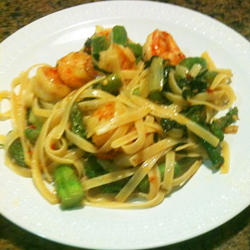 This pasta dish, incorporating asparagus and shrimp, is the essence of springtime. With the addition of the sambal sauce you have freshness and heat! 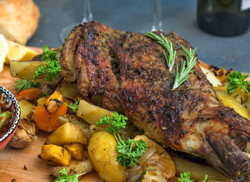 Lamb is always a favorite for Easter dinner. 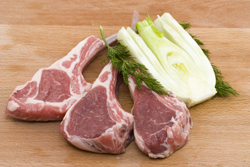 Instead of leg of lamb, try this easy-to-prepare lamb chop recipe. Seasoned with fresh herbs, it's a winner. 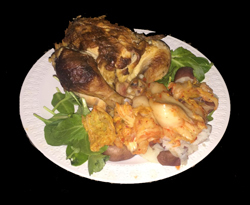 Prepared kimchi from a jar adds a beautiful flavor and color to this roasted chicken dish. Healthy, too. 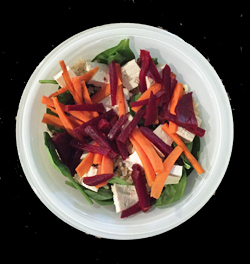 Spicy mizuna greens mixed with crispy now peas, salty tempeh, and red cabbage make a colorful, delicious salad that can be an entree or appetizer. This is an easy dinner the whole family will enjoy. Light but satisfying, this makes a wonderful dish with which to "freshly" start the New Year. 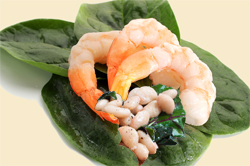 A wonderful salad with shrimp, bacon, and Dijon Mustard dressing. What could be better and more simple? Perfect for a luncheon or a light supper. 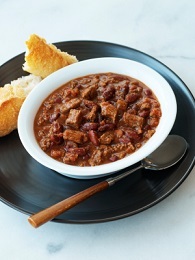 Our chili recipe this month is wonderful on a cold night. Dished over cooked brown rice, it is hearty enough for the man of the house and still very healthy. Not only tasty, but also filling, this warm lentil salad with apples and squash will become a New Year's cold-weather favorite. A quick meal made with rotisserie chicken and microwave brown rice with a hint of Middle Eastern tastes, this meal is great when you're rushed. 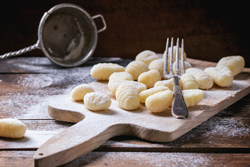 Fix a delicious gnocchi meal the easy way. Using shelf-stable gnocchi, canned tomatoes and fresh chard, you have a wonderful meal put together in minutes. This is one of those meals that is just perfect for a cold winter evening. The blend of mushrooms, paprika and sour cream and dill reminds one of Old Europe. An easy meat chili with a bit of heat. Lots of ingredients but simple to make. in just an hour and a half. Your family will be eager to taste this one. 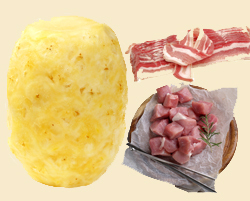 Do you love pork and pineapple together? This bacon wrapped pineapple stuffed with marinated pork pieces and then baked will knock your socks off! 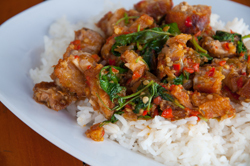 Spicy Thai flavors make this chicken dish memorable. 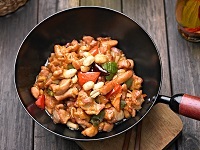 Using both tamarind and lime, this chicken dish is extra sour and scrumptious. This open-faced sandwich is a winner! 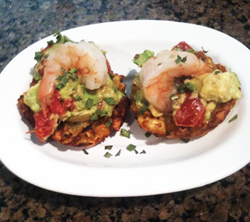 Served on a toasted English muffin, this makes a great pregame party dish. So easy to make and so delicious! 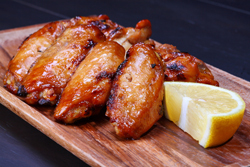 Don't buy marinade at a store. 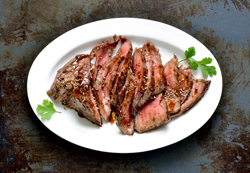 Make this wonderful tri-tip marinade with our Chemlali EVOO and wow your friends. It's good on chicken, too. The blend of fennel and lamb, enhanced by the taste of the Marsala wine, is fantastic. Great flavors for such a deceptively easy recipe. I made this with a cast iron square grill pan. 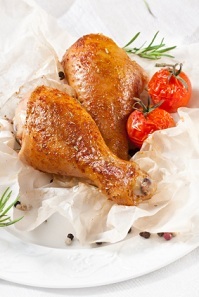 The spices and the pan produced a wonderfully spicy & moist chicken breast with beautiful char marks. This is a tasty pita sandwich that can be served for lunch or dinner. 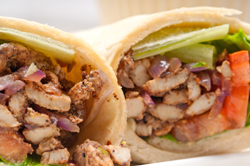 The spices give a wonderful Middle Eastern taste to this mixed chicken sandwich. This Iranian chicken stew recipe brings together sweet, sour and bitter flavors. A bit time consuming, but well worth the effort. Delicious! 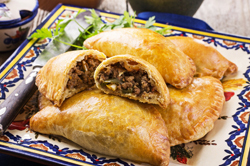 These empanada-like patties are spicy, flavorful and a real treat. 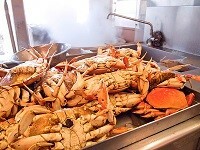 With a nice tossed salad they make a wonderful, satisfying dinner. Enjoy! 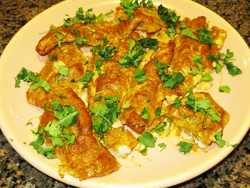 If you like Indian food, you will love this fish recipe. 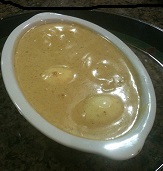 Fillets marinate in a yogurt sauce and then are baked. 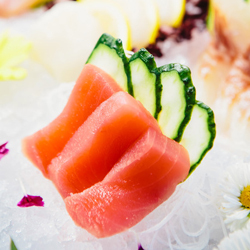 This is a wonderful new way to serve fish. 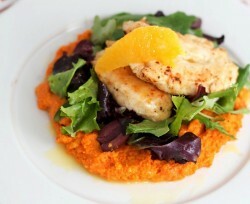 An easy, colorful entree when time is short. Works well with either chicken breasts or thighs. The oyster sauce, turmeric and sugar add tantalizing flavor. 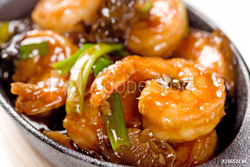 If you love prawns, you'll love this spicy-hot version of stir-fried prawns. This is a keeper. You may want to make extra, because you'll want more. 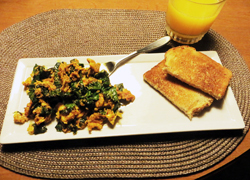 A quick and easy scrambled eggs breakfast that provides an easy way to add healthy kale greens and turmeric to your diet. This is a perfect weekend barbecue recipe. 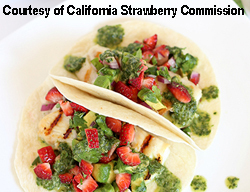 With the brandy and strawberry flavors, you will have people asking for more. Be sure to make plenty! 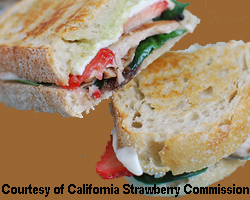 Courtesy of the Strawberry Commission we have a fresh-tasting spring sandwich featuring fresh strawberries that can be grilled or cooked in a Panini press. 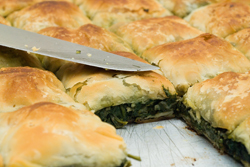 If you love Middle Eastern food, you will really like this recipe. 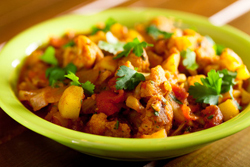 The blend of spices gives this stew a wonderful taste and the aromas will delight you. 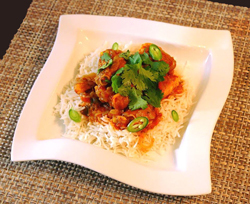 If you like curry, you will love this coconut chicken stew recipe. 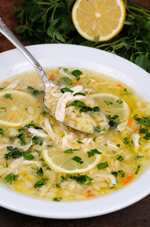 Using light coconut milk and low salt chicken broth, this recipe is a healthy entree for you and guests. A stew for a crowd. In Kentucky this is often served on Derby Day. It's a delicious, "throw in everything in the refrigerator" kind of stew. Scrumptious! 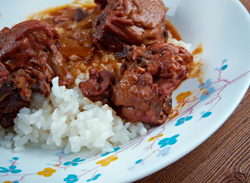 A tasty, mildly spicy pork stew that is a cinch to make. 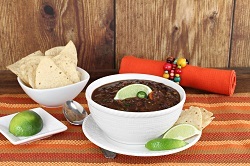 Serve with rice and black beans to serve more people. Don't forget the toppings! 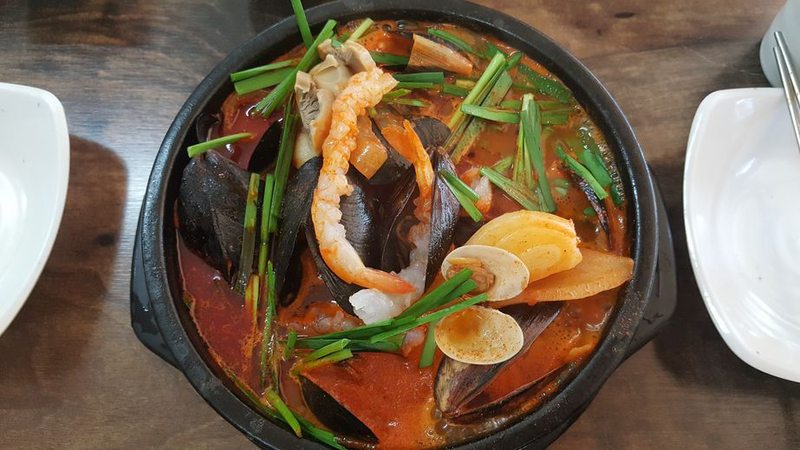 This is a tasty fish stew with a hint of African spices and curry. 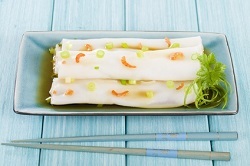 It uses a firm white fish, coconut milk, and lots of spices. A luscious blend of flavors. This is a very easy recipe. Put it together in a jiff early morning and enjoy a day of tempting aromas. You can play all day and everyone will think you slaved over the stove. 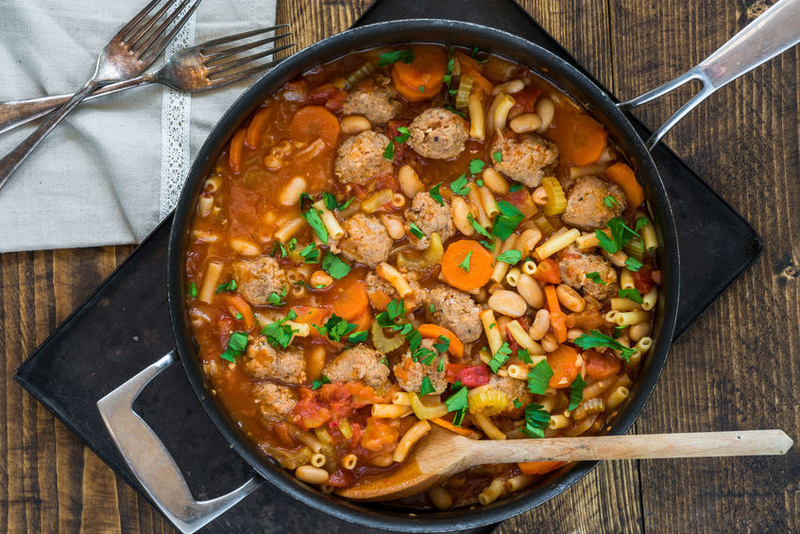 This delicious soup is easy and quick to make. 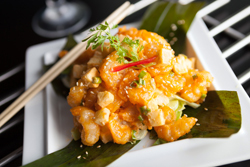 Spicy from the red curry paste and ginger, it will warm you up on these cold winter nights. A tasty beef stew, perfect for wintry evenings. Rich spices, loads of vegetables make for a hefty, healthy stew, guaranteed to satisfy the man of the house. This is a delicious fall version of salmon. Served with tasty and colorful pomegranate, lentils, and couscous, this is suitable for family or company dinners. This is an easy recipe that produces wonderful results. Put this in the crockpot in the morning and forget about it. 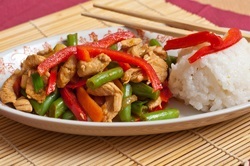 A wonderful Asian dinner is ready in 7-1/2 hours. For a sumptuous fall dinner, prepare this for your family. Its aroma while it cooks is divine. Everybody will be chomping at the bit for dinner to begin. If you love lamb and want an easy to prepare dish, this recipe is for you. Just a little chopping, then cook in a crockpot for 8 hours and you have a "to-die-for" meal. Do you love Eggplant Parmesan? 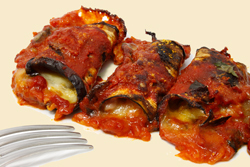 if so, you'll love this eggplant wrap. It has all the same flavors. It can be made a few days ahead of time. Great for a quick dinner. 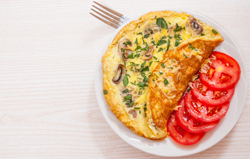 Great for breakfast or a light dinner, this omelette wraps around a tasty vegetable filling. A good "go to" dinner when time is short. This eggplant-stuffed-with-lamb dish is tasty and flavorful. 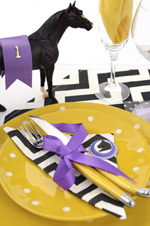 It is also colorful and a beautiful addition to your table. It can be served as a side dish or an entrée. 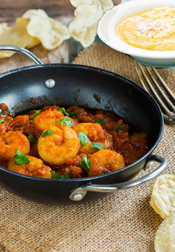 A very quick dinner recipe, this prawn dish combines the flavors of garlic, fennel and grapes for an unusual and tasty entrée. For a new way to stuff game hens or other birds, try out Spiced Grape and Almond Dressing. 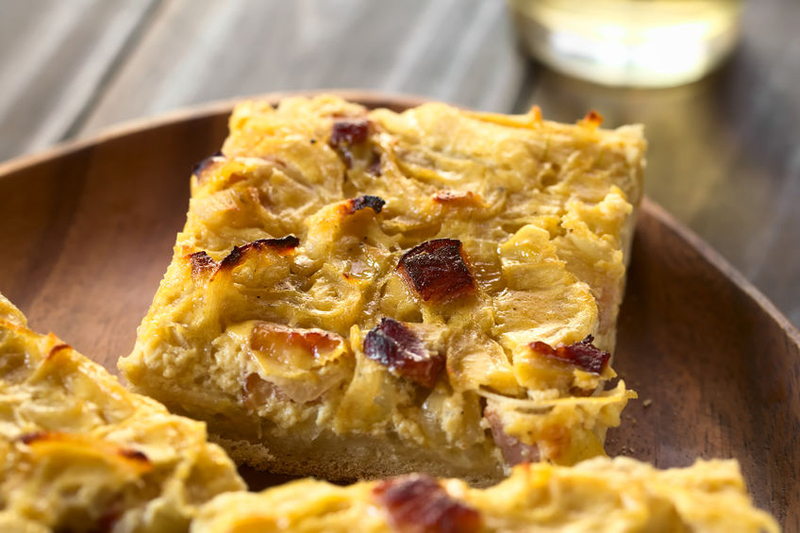 A somewhat sweet and crunchy alternative to the usual stuffings. 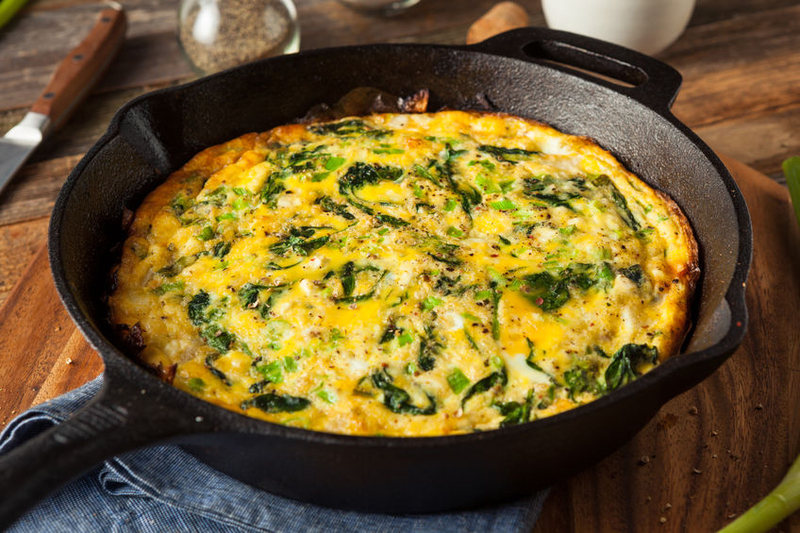 Formerly a southern breakfast dish, this tasty dish is now served for breakfast, lunch or dinner. 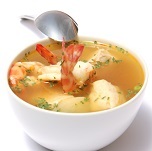 This is a great soup recipe for lunch or dinner and it's easy to make. Add a salad, some French bread (or chips), something to drink and dinner's ready! 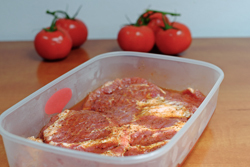 Tired of your usual marinades? Try this special Armenian-flavored marinade with chicken breasts for an especially tasty summer meal. 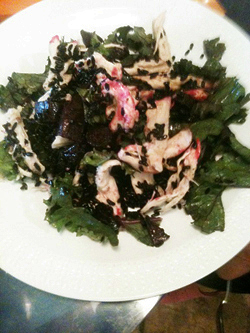 A healthy salad made with kale, black rice, beets, chicken, and pecans. The Lemongrass-Mint White Balsamic dressing gives it a very refreshing taste. 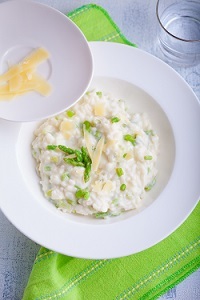 A special version of risotto with asparagus added for a refreshing spring "taste." Can be made in a vegetarian version, too. Lettuce wraps are becoming the rage. Even hamburgers are now served in lettuce. 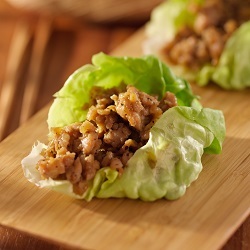 We're sure you'll enjoy this ground turkey dish with its Asian flavors and of, course, garlic. 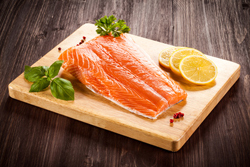 An easy yet elegant way to serve salmon. 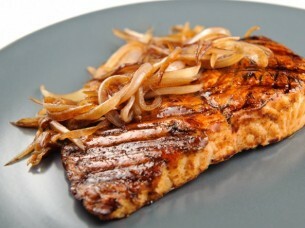 The combination of flavors in the marinade yield a lovely, fresh tasting salmon filet. Sometimes simple is best. 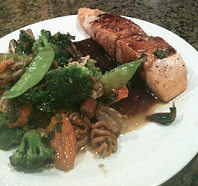 Asian flavors make this salmon dish extra special. Flaky and succulent. Nothing is better than noodles and gravy. Try our Spaetzle with Wild Mushroom and Gravy for a wonderful treat. Can be a side dish or a complete meal. A dish with a kick for Mardi Gras. Shrimp Etouffe is a standard in New Orleans but our roux is a light version, made with olive oil instead of the typical butter. Enjoy! 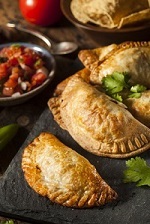 An adaptation of Rache Bradley-Gomez' empanada recipe. 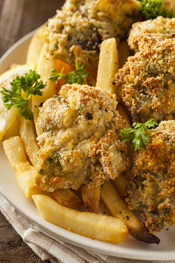 Using a mild white fish, this makes a tasty Lenten recipe that your whole family will enjoy. This is an interesting week night dinner or a weekend breakfast. 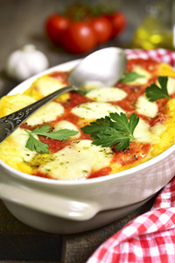 It's a satisfying meal in itself with eggs, potatoes, artichoke hearts and tomato sauce. 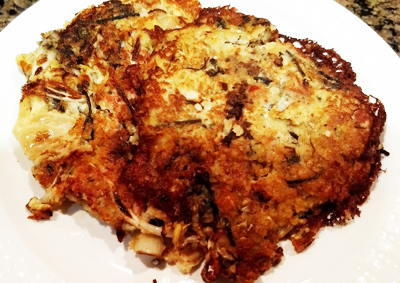 For a new take on latkes, try our spaghetti squash patties. 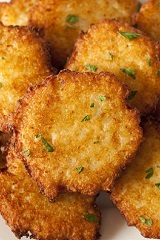 Half the calories of traditional potato pancakes, these are delicious and easy to prepare. A rich delicious turkey soup. The perfect way to use every last bit of goodness from your holiday turkey. 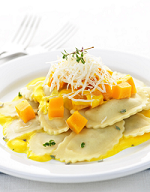 This is a really easy butternut squash ravioli recipe that can be made in minutes after the squash is cooked. 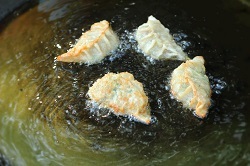 By using wonton skins, these ravioli are a snap to prepare. 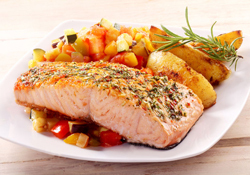 To jazz up salmon, which tends to be mild-flavored, try this herbed rub. The mustard gives it a nice bite and the herbs lend a lend a tasty flavor. For a special occasion, this recipe will delight you and your guests. Roasted with herbs, mustard, and Wild Mushroom and Sage Olive Oil, it's delicious! 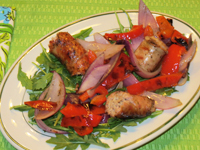 A lovely dinner salad that features Italian sausage with a sweet light dressing that counters the sharpness of the arugula. "A keeper" says Mike. 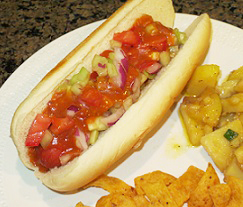 A delicious, fresh variation on the traditional hot dog. Quite tasty and simple to make. 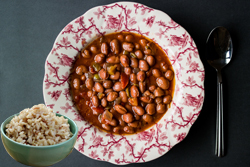 Considered the national dish of Brazil, this beans and rice recipe is hearty enough to sustain you through all the excitement and screaming for your team! A versatile summer pasta salad, complete with vegetables and protein. Can be made with a variety of fresh veggies. The perfect dinner for hot evenings. Tasty tacos with Asian flavors. Not be missed! Tender, pork shoulder and vegetables slow roasted with Hojiblanca EVOO. For the hot weather ahead, try this delicious citrus chicken salad recipe one of our customers created and shared with all of us. Refreshing citrus and Mediterranean flavors. 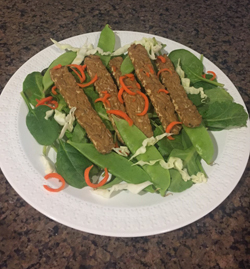 This protein rich salad is a standard French delight. 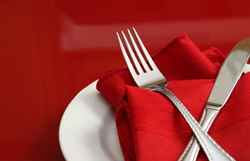 It can be an entrée for a nice lunch or a side dish for a special dinner. It's wonderful! Individual servings of baked eggs, topped with herbs and Parmesan, served with toasted French bread or Brioche.....a great breakfast for two! A hearty potato and egg breakfast seasoned with Italian Herbs and Tuscan Herb Olive Oil. A great way to start the day and very easy to prepare, too. 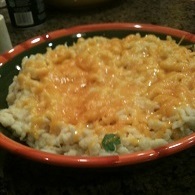 German spaetzle is a wonderful treat for the family. Kids will love them and they can be served in many ways. Check out our three variations. A favorite in the Schuster household when we were growing up, this is the German version of macaroni and cheese. The kids will clamor for more! A healthy addition to spaetzle, cooked swiss chard and Tuscan Herb Olive Oil add an interesting twist to this German favorite. Salmon loaf the Italian way. 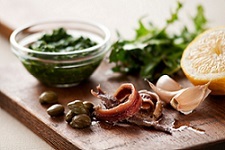 The Italian Salsa Verde is full of fresh herbs, capers, lemon, garlic and anchovy. Perfect soup for a rainy afternoon. Simple to prepare and delicious. 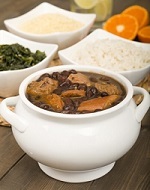 Enjoy a blend of Portuguese and Chinese flavors. For a hearty winter soup, perfect for eating while watching the Winter Olympics, try this Cabbage Borscht. It will keep you warm while watching those icy events. A delicious winter soup. Don't be put off by the number of ingredients. It's really an easy recipe and is well worth the effort. A scrumptious veggie chili poured on top of piping hot polenta....what could be better on a cold winter evening! Your family will love it and so will you! It goes together quickly. One of the oldest comfort foods around, the pot roast emits delicious aromas as it cooks and makes everybody eager to sit down to dinner. Tried and true! 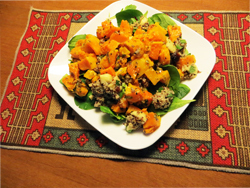 Want a filling wintertime salad - one that can even be used as a full meal? Try this hearty Roasted Vegetable Winter Salad. It's tasty and easy to make. 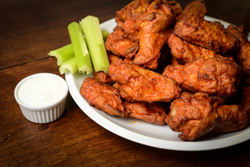 If you're looking for a satisfying lunch while watching your Saturday or Sunday football games...this is it! It will really impress your guests. 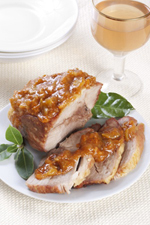 Tender baked porkchops with apples in a vinegar/balsamic condiment gravy......yummm! 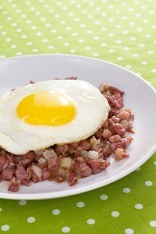 A favorite German dish, delicious with Rotkohl (see recipes) and potatoes. Pork cutlets done the German way, served with a delicious dill sauce. Our red cabbage recipe makes a great side dish. 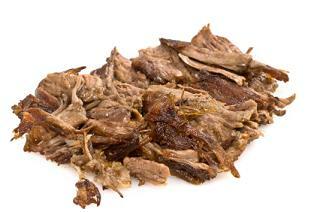 Love Sauerbraten but hate the time it takes to make? This is a delicious substitute that gives you all the same flavors of that time consuming favorite. A delicious side dish or entree for fall. Nothing beats the aroma of onions cooking! A vegetarian entrée that makes one think of fall and the forest. 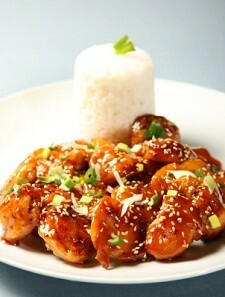 Hot and Spicy Asian chicken recipe. 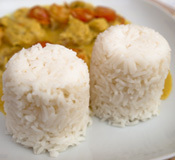 Serve by itself or over rice. Great dinner. Everyone will love this and will ask for more, so make plenty! A quick and tasty dinner that can be put together quite easily. Nice transitional meal as we enter the summer to fall season. The ultimate breakfast or lunch for the cowboys or hungry persons in your home. Hearty, filling and just the perfect breakfast lunch for those lazy Sunday mornings. A wonderful spring or summer salad, topped with succulent chunks of broiled lamb and bleu cheese. What could be more delicious! A great chili for summer picnics and potlucks. Good on wintry evenings too. Lots of peppers. Really spicy! You'll love it! This flank steak recipe makes the most delicious barbecued meal. 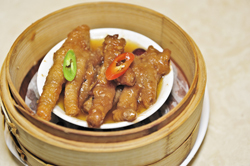 The combination of soy, ginger, honey and garlic cut with the acidic taste of the lime juice is a delight to the palate. This is one orzo dish you won't forget! It is scrumptious. 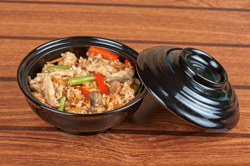 Chicken and vegetables mixed with the orzo combined with Sesame Oil and Honey Ginger Balsamic Condimento make for an Asian delight! Woodsy flavor of the springtime morel mushrooms in a creamy asparagus sauce lends a wonderful taste to pasta and grilled meat. The perfect dish for St. Patrick's Day. Easy to prepare and a family favorite for adults and kids alike. A wonderful blend of spices makes this diced chicken recipe a "keeper." 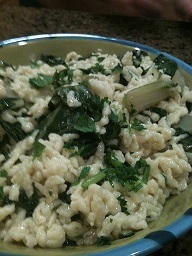 Serve over noodles or rice and garnish with green onions. Brined and then slow roasted turkey legs deliver exceptional taste and juiciness. The combination of molasses and pomegranate flavors is delicious! Looking for a quick dinner for those late nights at the office? PIck up a roasted chicken on your way home and have this on the table in 30 minutes. Healthy chicken salad, chock full of berries, seed, nuts and greens. Can be used as a starter or as a full meal. Quick and easy fish and chips with half the calories of the variety you buy at a fish and chips shop. 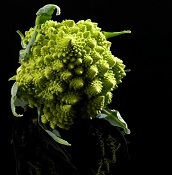 Scrumptious pasta dish featuring a most unique vegetable....a relative of broccoli. A hearty soup for the fall. A bit labor intensive but well worth the effort. Serve with a nice green salad and dinner is ready! For a change of pace, try these delicious and succulent pork chops served with a green salsa topping. Unique pot roast, shredded and served in whole wheat tortillas with condiments. 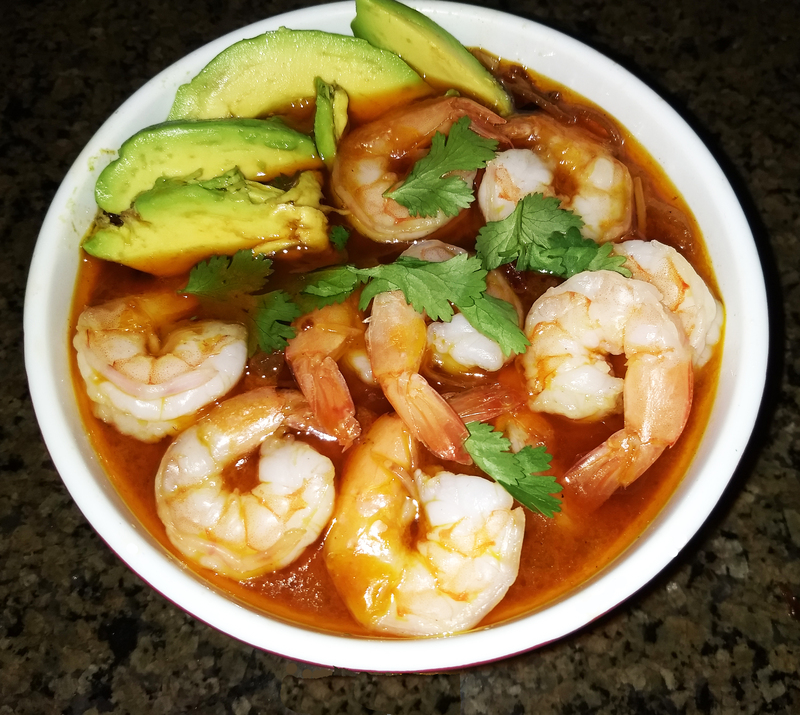 An old family recipe from the grandmother of Marisolio's owner, Mary Schuster. 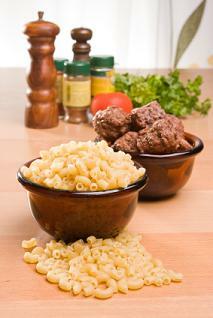 Rich, creamy macaroni and cheese with southwest flavors and the surprise addition of adobo flavored meatballs. Delightful cold salad or entree for hot weather. The herbs give this a refreshing taste. 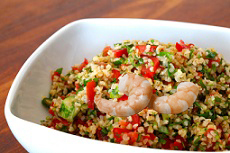 Can be made without the shrimp for a vegetarian meal. A spicy, delicious vegetable soup that can be served either hot or cold. Perfect for winter or summer. 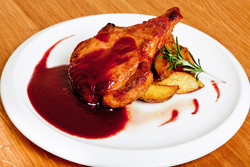 Tender chunks of pork flavored with luscious herbs and grapes. A delightful meatless meal for your family. The kids will love the ear-shaped, cheesy pasta. A yummy "red" spaghetti dish, tossed with broccoli, garlic and cheese. 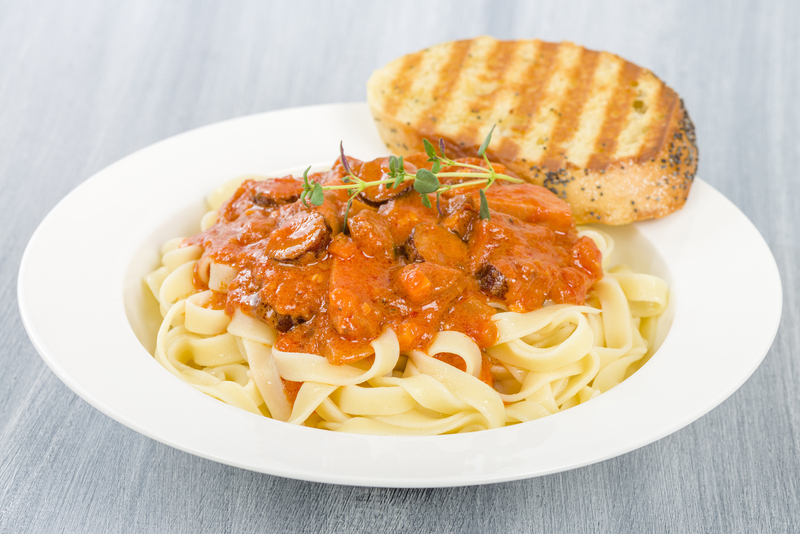 Serve with hot garlic bread and salad and you're all set for a spectacular dinner. Tasty greens topped with thinly sliced steak, surrounded by tomatoes and Italian cheese. Tender bite-sized chicken with a distinct apricot flavor. Delicious year-round entree. What's Memorial Day without a barbecue!! Try this savory marinade and you'll be happy you did. 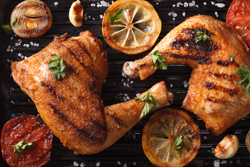 A delicious garlicky, fruity marinade for your holiday barbecuing. A delicious pan-seared salmon dish topped with a creamy rosemary and wild mushroom sauce. Cheesy, creamy polenta made from our Cobrancosa EVOO, hearty blue cheese, and delicious leeks perfect for a satisfying meal any time of the year! Al dente orzo with fresh shrimp, Organic Tuscan Herb Olive Oil, La Folia Pinot Grigio, tomatoes, oregano, crushed red pepper, and garlic.